Jerky used to be the kind of tough, bland snack chewed only by survivalists, truckers and your neighbor who hangs dead deer upside-down in his garage. Now artisanal jerky makers are popping up all over the country, boasting their dehydrated meat’s health benefits, unique flavors and jaw-pleasing tenderness. Jerk N’ Pickle may be our new favorite jerky. Made in small batches in Belmont, Calif., the natural Angus beef jerky is marinated in celery juice, soy sauce, carrot juice, hand-brewed Worcestershire-style sauce and spices. We literally could not stop sniffing the Jalapeño jerky bag, which was like sticking our noses into a big bowl of roasted peppers. We also loved the Hot Teriyaki flavor, which left us with a cool, after-swallow burn. In South Africa, there’s a thicker form of peppery jerky called “biltong,” which you can try out with this recipe from Jerk ‘N Pickle in Belmont, C.A. “Our style beef jerky is a savory and dry style jerky; the way it was made in the old west,” says David Yosso, co-owner. Yosso calls his “Black Pepper” flavor a “perfect launching point” for the home cook. “It pairs well with almost every high-alcohol beer and especially well with aged scotch,” he says. “One should use a dehydrator set to 150 degrees fahrenheit to achieve the dry cowboy-style jerky we prefer.” An oven at 150 degrees fahrenheit will work but require more “babysitting” (flipping and rotating the meat) to avoid burning. Yosso’s recipe calls for natural “inside round” beef, although London broil is more readily available and easier to find in your local grocery store. Thoroughly whisk the dry ingredients with the wet ingredients. Add sliced beef piece by piece and massage into marinade to allow for even distribution of ingredients. Refrigerate overnight (10-12 hours). Place into home dehydrator or oven at 150 degrees for approximately six hours. Check and rotate as needed. Remove at desired texture and doneness. Last year, during our Month of Beef, we surveyed 10 of the best beef jerkies. Some, like Slim Jim and Jack Links, are made for cheap and easy road trip snacking. But others are more like a fine wine or well-made craft brew — although typically more expensive, these artisanal jerkies contain levels of complexity not found in the average gas station variety. They’re meant to be savored, not inhaled, moving them away from “pantry staple” and toward “birthday present” on the “frequency of jerky consumption” spectrum. Think of key words like “wholesome,” “hormone-free” or “filet mignon”. But as is the case in any group testing, we missed a few solid options. Now, we want to rectify that mistake with this beefy refresher of three more great artisanal jerkies. For the first few bites, it’s almost crunchy, but the hardest of the three jerkies eventually melts in the mouth. Not only do the folks at Jerk’n Pickle use choice Angus, they also use vegetable juice, giving the meat a tasty broth-like flavor. 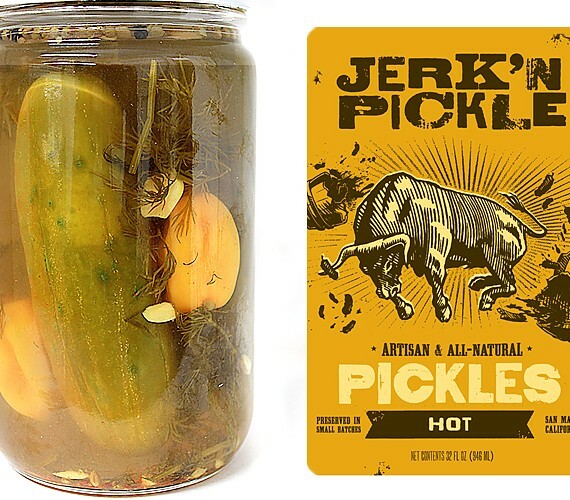 For those concerned about animal rights, Jerk’n Pickle raises their cows on-pasture without antibiotics and hormones. The only downside is that it’s not made from 100 percent grass-fed beef, but if that’s your main concern, you’re probably the type to buy jerky, anyways. We’ve got so many great new vendors at the market this season! One of our newest vendors at the market is Jerk ‘N Pickle, offering an array of pickles and beef jerky, from spicy to sweet to savory! Currently this vendor is at the market bi-weekly, so every other week you will find their stall in line with some of our liveliest new vendors: Grandma’s Homemade Jamand Papi Chulo Salsa. If you’re lucky enough to pass by Achadinha Cheese Co. when there are not five others sampling their delicious products, you may be given a bit of cheese to try with a sweet pickle! That’ll be sure to get your taste buds dancing (if Papi Chulo’s music and salsa hasn’t already!). 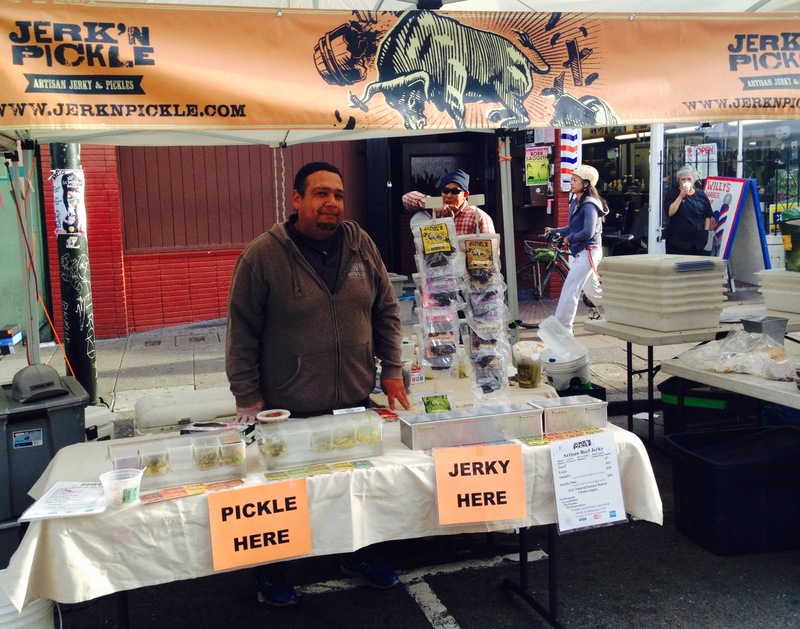 Jerk’N Pickle is a small family-owned business, founded in 2011 and located in Belmont, CA. The jerky is carefully handcrafted from All-Natural Choice Angus Beef, marinated in a secret mixture of ingredients, while their pickles focus on using only local, sustainable, and organic ingredients. A few of the products that you will find at their stall at Mission Community Market range from spicy green beans, half sour pickles, barrel fermented (their only pickle with probiotics! ), pickled beets, jalapeño rings–the list goes on! Some of the jerky varieties you can find at the stall are black pepper, teriyaki, hot pepper, jalapeño, and more! In the near future, Jerk ‘N Pickle hopes to be at the market every week, filling our market bags with their delicious products weekly. Their products come with several added health benefits, including fiber, iron, and small amounts of potassium, vitamin C, and vitamin K! Stop by the market this week from 4-8pm and grab some tasty pickles and jerky for your weekend picnic! Whether you like something sweet, sour, spicy, tangy or tart, the owners of a Belmont-based organic company say they have something in stock. The namesake Jerk’N Pickle company is David and Denise Yosso’s family concoction of recipes they’ve been perfecting for three years after tapping into a niche market of their own. David Yosso, 36, said he makes and designs playground equipment while Denise Yosso, 41, used to be in the wine business. However, about three years ago, they began to work with Denise’s brother pickling and making beef jerky. The three buckled down to perfect the pickle-jerky duo and “we have a winning name, but we have a very serious product,” David Yosso said. Their carnivorous customers can choose from eight flavors of all natural, pasture-raised angus beef jerky that includes teriyaki, habanero and gluten and sugar free. For those who prefer some with a crunch, their artisan pickle line boasts unique and original mixes like dill, spicy, half sour and barrel fermented pickles. But the pickling doesn’t stop there; Jerk’n Pickle also sells spicy green beans, jalapenos and beets. All are certified organic from Webb Ranch in Portola Valley, David Yosso said. Denise Yosso said the Jerk’N Pickle idea stemmed from her childhood in Southern California and David Yosso’s growing up in New York. “I’ve been eating beef jerky my whole life. We used to take road trips every summer and we’d always eat beef jerky, my siblings and I. And David’s family is from Brooklyn and Queens so he grew up eating pickles. So we decided to put the two together, and the name’s kind of catchy too,” Denise Yosso said. Making jerky is a time and materials consuming gig, David and Denise Yosso said. The Yosso family said they have a commercial kitchen in Belmont and although they begin with about 200 pounds of meat a week, it yields about 60 pounds of jerky. “When you make jerky, it’s very cost intensive. … It’s labor intensive because you have to trim and slice all the meat, then you marinade it then dehydrate it. So at the end of the day you have about a third of what you started with,” Denise Yosso said. The amount of time it takes to make and preserve pickles depends on the variety and the fermentation process which ranges from one to three weeks, David Yosso said. But the love and dedication behind their perfected pickle jerky combo will impress a range of palates, David Yosso said. Curious consumers can find Jerk’N Pickle products at several farmers’ markets throughout the Bay Area, at 30 different independent retailers and at various events, David Yosso said. People can also visit the website to order direct and sign up up for their jerk of the month club, David Yosso said. The company is rapidly expanding and the Yossos said they hope to find more help. Belmont couple find success with Jerky and Pickle business. BELMONT — David and Denise Yosso have made some good choices in building their small business, but their best decision was vinyl-wrapping the van. Ever since they transformed a 1985 Toyota into a rolling green-and-yellow advertisement for their beef jerky and pickles, sales have taken off. The Jerk’n Pickle van is so easy to spot, some people think there must be more than one. “They’ll say, ‘Man, I see your vans all over town,’ ” said David Yosso, 35, who has funded the company with money earned at his job selling and installing park playgrounds. The Yossos created Jerk’n Pickle in January of 2011 with Denise’s brother David Martinez, whose lifelong penchant for jerky and pickles served as inspiration. Martinez also provided numerous recipes he’d developed. “When we were growing up, that was what he liked to eat,” explained Denise Yosso, 39. The Yossos sell eight varieties of jerky, seven kinds of pickled cucumber and four other pickled vegetables online and at farmers markets and Bay Area retailers. They have one employee who handles the food preparation out of a commercial kitchen in Belmont. The couple have discovered there are global markets for their products, and that pickles especially are subject to strongly held regional and personal preferences. People from the East Coast tend to like barrel-fermented New York deli-style pickles, the Yossos say. Midwesterners — and Russians — prefer them half-sour. As for jerky, South African customers have told the Yossos their black pepper variety is reminiscent of a specialty there known as “biltong.” One patron ships the dried meat to family members in China. And a recent mention in Air Canada’s in-flight magazine spurred an order by the owner of the Montreal Canadiens hockey team. That global reach has helped get Jerk’n Pickle off the ground. The next step is turning a profit, which the Yossos hope to accomplish in 2013. Their emphasis on high-quality, natural ingredients — they use a corn syrup-free Worcestershire-style sauce for the jerky marinade — has gotten their products on the shelves of nearly a dozen stores, most of them upscale. Draeger’s of San Mateo has picked up the pickles. Keith Myers, director of the store, said in an email that Draeger’s tries to support local food purveyors as much as possible. With their retail accounts growing, the Yossos continue to experiment with ways to cut costs and expand their reach. On a recent morning at their kitchen, they said a Woodside restaurant has taken an interest in their spicy green beans. “These are awesome in bloody marys,” said David Yosso, pulling a container out of a steel-paneled refrigerator. “I think we might try to push these in some bars,” added Denise Yosso. Home made beef jerky and pickles are the hallmarks of this artisan venture. Preserving foods has been around for a long time. Using these time honored traditions in a modern way, some very flavorful products arise. Jerkys are marinated for over 16 hours, then dried into a chewy, spicy snack. Vegetables are brined and flavored before preserved in jars. You can find these gourmetgoodies in farmers markets and in local groceries. Purchase singly or in combo gift packs. You can even sign up for the Jerk of the Month club so you never run out. Jerk’N Pickle, based in San Mateo, makes the two components its name suggests. For this tasting we focused on the Jerk. Their use of Angus beef, noted neither as organic or as grass-fed, likely gave them the edge for flavor, though it won’t score them any points with the anti-KAFO crowd. The jerkys all started off super-stiff, like you might imagine hard tack must have been, but softened up with a few chews. Original: Rich flavor of beef and barbecue, and good flavor throughout. Notes of Worcestershire and soy sauce are noticeable, and provide a flavor-component akin to galbi. Black Pepper: The pepper presents first and sticks around, bright with spice and earth. Only at the finish does the flavor of the meat gain the upper hoof. You’ll love it, if you love black pepper. Jalapeño: Again, the flavoring comes through strong and dominant. You recognize the jalapeño immediately. Habanero: Here the spice of the pepper is a bit more integrated but still clearly voiced. The heat here is less intense than in the Jalapeño flavor. Hot Pepper: Not as hot as Jalapeño. Nice, well integrated spice.